10 Charlesgate East is located on NE corner of Marlborough and Charlesgate East, with 451 Marlborough to the east, across Alley 908, 4 Charlesgate East to the north, and 24 Charlesgate East (419 Commonwealth) to the south, across Marlborough. 10 Charlesgate East (463 Marlborough) and 459 Marlborough were designed by Rotch and Tilden, architects, for Thurlow Weed Barnes and his wife, Isabel Frances (Morris) Barnes. Isabel Barnes is shown as the owner on the original building permit application for 10 Charlesgate East, dated July 29, 1889, and for 459 Marlborough, dated September 16, 1889. 10 Charlesgate East and 459 Marlborough were built as separate houses. Both were subsequently integrated with The Charlesgate at 4 Charlesgate East: 10 Charlesgate East in 1892 and 459 Marlborough in 1907. Thereafter, they were operated as a single property – The Charlesgate, the Charlesgate Hotel, or Charlesgate Hall – until December of 1996, when the property was subdivided into two separate condominium buildings: the Charlesgate Condominium at 4 Charlesgate East (comprising the original Charlesgate building) and the Barnes Mansion Condominium at 10 Charlesgate East (comprising 10 Charlesgate East and 459 Marlborough). Isabel Barnes purchased the land for 4 Charlesgate East and 459 Marlborough from Augustus Lowell in two transactions. On July 27, 1888, she purchased a lot with a 125.33 foot frontage on Marlborough and a 45 foot frontage on Charlesgate East and on the alley at the west (the alley running from Marlborough north to connect with the alley running East to Massachusetts Avenue). 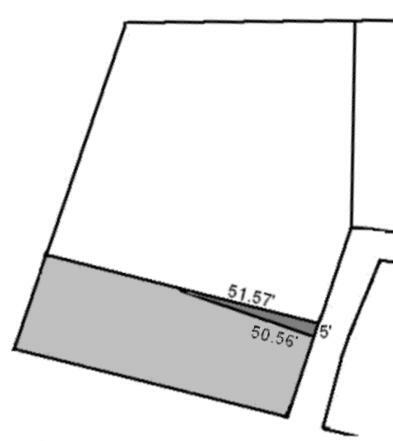 On September 16, 1889, she purchased a triangular shaped lot extending the frontage on the alley by 5 feet, with the northern line running west 51.57 feet to connect with the boundary of the first lot at a point 50.66 feet west of the passageway on the original boundary. The lots comprised the southern portion of parcel that Augustus Lowell had purchased on January 26, 1886, from a real estate investment trust formed by Francis A. Palfrey, Francis A. Osborn, and Grenville T. W. Braman, part of a tract of land the trust had purchased on June 1, 1880, from the Boston Water Power Company. Click here for an index to the deeds for 10 Charlesgate East and 459 Marlborough, and click here for further information on the land west of Massachusetts Avenue between the south side of Beacon and the north side of Commonwealth. Thurlow Barnes had been associated with his grandfather’s newspaper in Albany, New York. He and Isabel Morris had married in October of 1887, after which they lived in Boston and he joined the publishing firm of Houghton-Mifflin & Company. They lived at 247 Marlborough during the 1889-1890 winter season, and then traveled abroad. Upon their return, they lived at the Hotel Vendôme. On June 2, 1890, Isabel Barnes sold the recently-completed house at 459 Marlborough to Mary Alice (Rawson) Turner, the wife of Albion Bryant Turner. By 1892, Thurlow and Isabel Barnes were living in New York City. The Charlesgate had been completed in 1891, a seven story apartment hotel with entrances on both Beacon and Charlesgate East. It was designed by J. Pickering Putnam and financed by him and members of his family: his mother, Harriet (Upham) Putnam, the widow of John Pickering Putnam, his sister, Sarah Gooll Putnam, and his brother-in-law and sister, Horace John Hayden and Harriet (Putnam) Hayden. The Charlesgate accepted both travelers and permanent guests. The emphasis, however, was on permanent guests and, unlike the Hotel Vendôme and the Hotel Somerset, The Charlesgate did not have a ballroom or other large rooms for public events. J. Pickering Putnam and his wife, Grace Cornelia (Stevens) Putnam lived at The Charlesgate from the time it was completed. They previously had lived at The Oxford (southeast corner of Exeter and Huntington). As originally designed, The Charlesgate occupied an irregularly shaped lot with frontages of about 103 feet on Beacon and 105 feet on Charlesgate East. When it acquired 10 Charlesgate East, it built additional floors to match the height of its original building. The addition resulted in The Charlesgate’s western façade extending the entire length of Charlesgate East between Beacon and Marlborough. 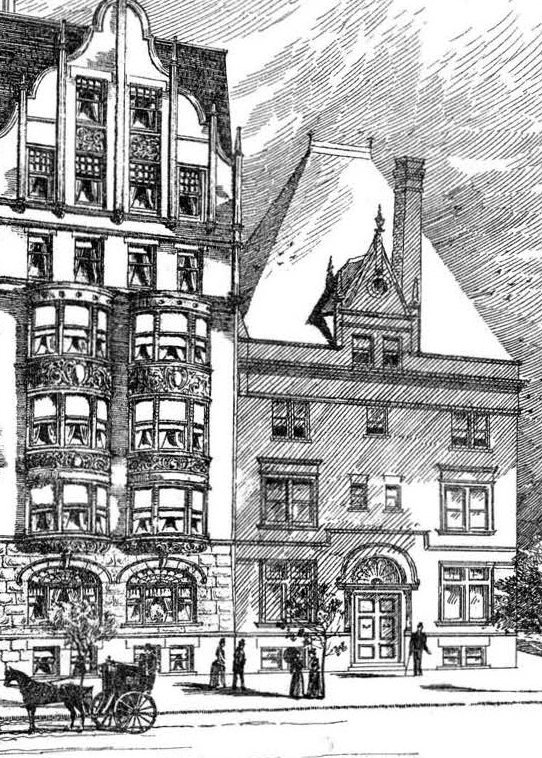 A September 17, 1892, edition of the American Architect and Building News noted that the property “is now being raised in height, giving about six additional suites to the hotel” (as compared with the thirteen suites reported by the Herald). Like the building at 4 Charlesgate East, “the additional work will be of ‘slow burning’ construction,” which the article described in detail. On November 26, 1892, J. Pickering Putnam transferred 4-10 Charlesgate East to a trust created to formalize the Putnam family’s investment in the property, with Horace Hayden as trustee. The trust recorded that Harriet (Upham) Putnam had advanced $30,000, Sarah Gooll Putnam had advanced $15,000, J. Pickering Putnam had advanced $100,000, and Horace Hayden had advanced $80,000 with the option of advancing an additional $20,000. The trust provided that, upon sale of the property, the amounts advanced by Harriet (Upham) Putnam and Sarah Gool Putnam were to be repaid with interest, then the amount advanced by Horace Hayden, and then the amount advanced by J. Pickering Putnam. Any surplus thereafter would be divided between Horace Hayden and J. Pickering Putnam, with the proportion determined by the amount advanced by Horace Hayden ($80,000 up to $100,000). Horace Hayden died in December of 1900, killed when he fell from the window of his home on West 76th Street in New York City. On May 22, 1901, J. Pickering Putnam, Harriet (Upham) Putnam, and Sarah Gooll Putnam concurred in the appointment of Harriet (Putnam) Hayden as his successor trustee. On June 1, 1907, Harriet Hayden purchased the townhouse at 459 Marlborough, which had remained a private residence. 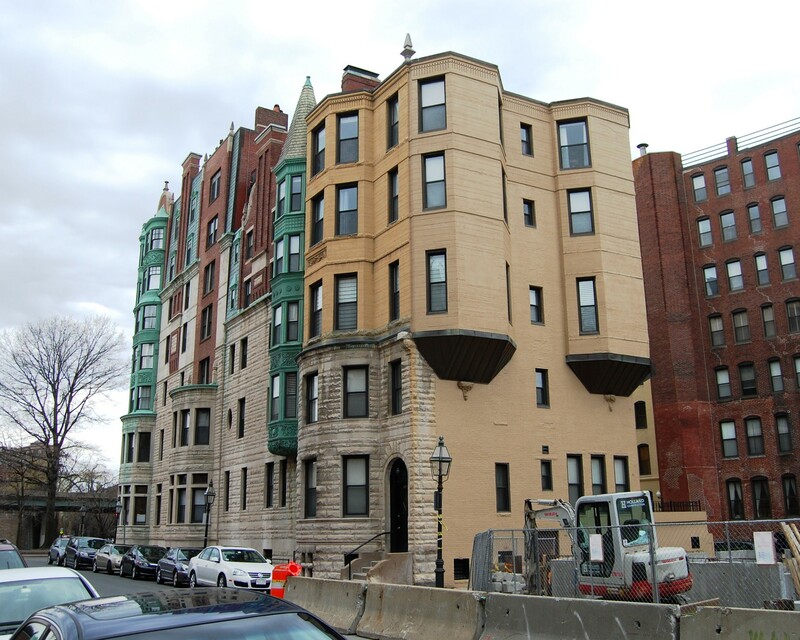 She converted it into five apartments which were leased in conjunction with The Charlesgate. It remained her separate property, however, owned by her as an individual, whereas 4-10 Charlesgate East were owned by her as trustee of the Putnam family trust. Harriet (Upham) Putnam died in May of 1905 and Sarah Gooll Putnam died in October of 1912. J. Pickering Putnam and Grace (Stevens) Putnam continued to live at The Charlesgate. In about 1912, Herbert Garfield Summers became manager of The Charlesgate. He and his wife, Fanny M. (Smith) Summers, lived in the hotel. In June of 1915, Harriet Hayden filed for (and subsequently received) permission to replace a small window in the basement on the east side of 459 Marlborough under the “bay window nearest back” with “two larger windows with 16 inch brick pier between them.” The occupancy was indicated as five apartments. The remodeling was designed by J. Pickering Putnam. 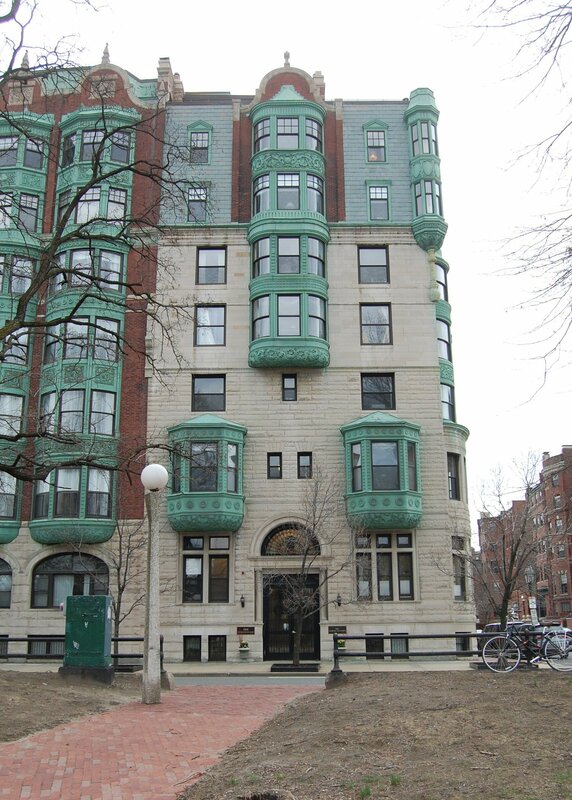 In May of 1916, Harriet Hayden, as trustee, filed for (and subsequently received) permission to enlarge eight basement windows on the Marlborough façade of 10 Charlesgate East “so as to give more light in these rooms.” The remodeling was once again designed by her brother. J. Pickering Putnam died in February of 1917. 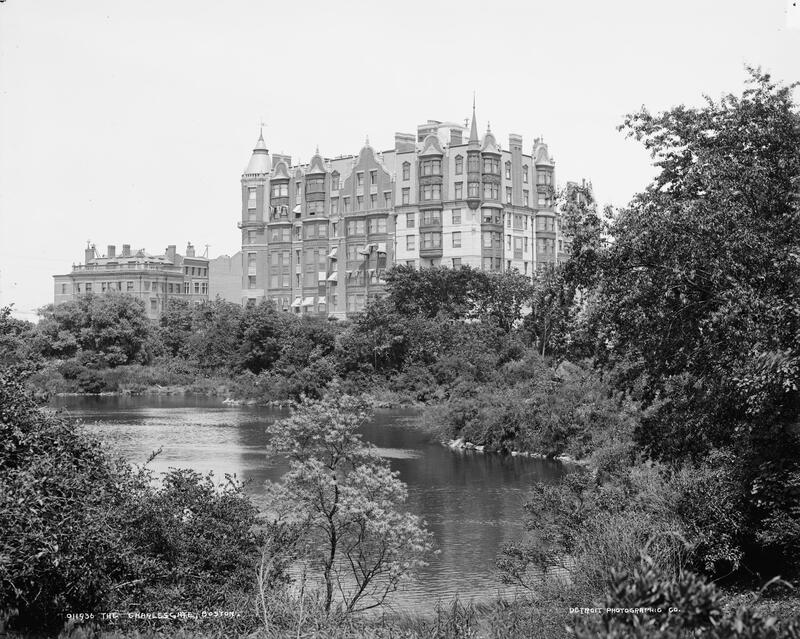 Grace Putnam continued to live at The Charlesgate until shortly before her death in April of 1948. On July 30, 1923, 4-10 Charlesgate East were acquired from Harriet Hayden, as trustee of the Putnam trust, by Herbert G. Summers and Miss Mary Grosvenor Potter, an attorney in New York City. On the same day, they also acquired 459 Marlborough from Harriet Hayden, which she had continued to own in her own name. Herbert Summers continued to manage the property, and he and his wife continued to live there. He also owned the Cliff House hotel in Scituate. Herbert Summers died in February of 1937. Fanny Summers continued to live at the hotel and their son, Richard Norman Summers, assumed management of the property. All of the residents of The Charlesgate were required to move by September 1, 1947, among them, Grace Putnam and Fanny Summers. In July of 1947, Boston University applied for (and subsequently received) permission to convert the property into a dormitory for 400 female students, to be called Charlesgate Hall. It remained a Boston University dormitory until the early 1970s. On November 29, 1972, Charlesgate Hall (4-10 Charlesgate and 459 Marlborough) were acquired from Boston University by Anthony Wine and his wife, Shirley Jean (Smith) Wine, as trustees of the Charlesgate Realty Trust. On August 28, 1973, the Chandler School Corporation purchased Charlesgate Hall from Anthony and Shirley Wine. On June 13, 1975, the Wines foreclosed on a mortgage given by Chandler School Corporation when they purchased the buildings and took back possession of the property. On October 1, 1975, Robert M. Mardirosian trustee of the D. A. M. Realty Trust, purchased Charlesgate Hall from Anthony and Shirley Wine. On November 5, 1975, Robert Mardirosian transferred the property to Marcor Associates, Inc., of which he was the treasurer and Peter V. Corea was the president. Although the legal occupancy remained a dormitory, Marcor Associates operated the property as a multiple dwelling, either apartments (as it was described in the city directories) or a lodging house, retaining the name Charlesgate Hall used by Boston University. On November 21, 1979, Charlesgate Hall was purchased from Marcor Associates by Modern Continental Enterprises. It continued to operate the property as a multiple dwelling. On June 22, 1981, Charlesgate Hall was purchased from Modern Continental Enterprises by Emerson College. It operated the property as a dormitory. On September 29, 1995, Charlesgate Hall was purchased from Emerson College by 4 Charlesgate East LLP, organized by real estate developer Neil St. John Raymond. In April of 1996, 4 Charlesgate East LLC applied for (and subsequently received) permission to convert the property from a dormitory into 102 apartments. 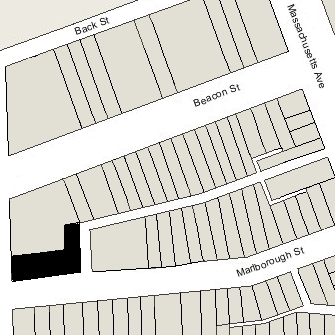 In December of 1996, Charlesgate Realty LLC (successor to 4 Charlesgate East LLC) filed for (and subsequently received) permission to subdivide the property, creating one lot of approximately 12,259 sf at 4 Charlesgate East, equivalent to the original Charlesgate Hotel, with 57 units, and a second lot of approximately 7,339 sf at 10 Commonwealth, equivalent to the former houses at 10 Charlesgate East and 459 Marlborough, with 24 units. In January of 1998, Charlesgate Realty LLC amended its original permit to reduce the number of units at 4 Charlesgate East from 57 to 56 units. 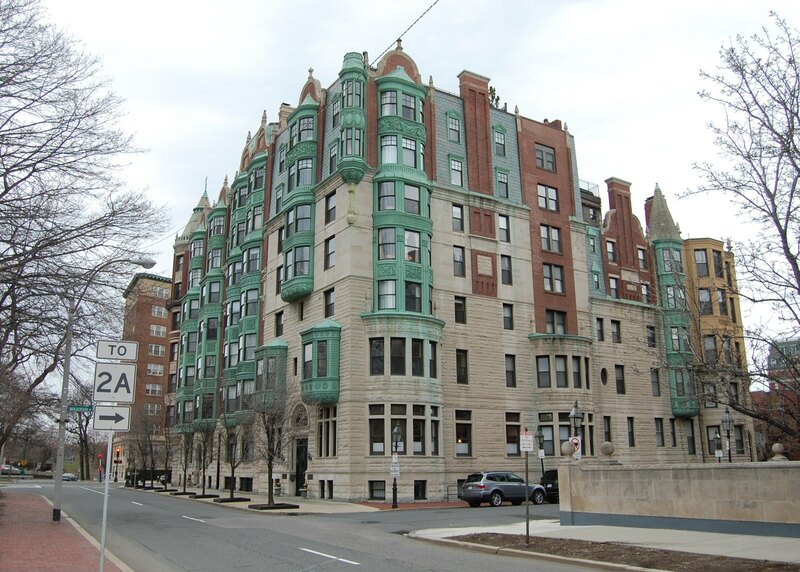 On January 26, 1998, Charlesgate Realty LLC converted the two buildings into two separate condominiums: the Charlesgate Condominium at 4 Charlesgate East with 56 units, and the Barnes Mansion Condominium at 10 Charlesgate East with 24 units. 459 Marlborough was designed by Rotch and Tilden, architects, and built in 1889 by Melville C. Grant, mason, and John Rawson, carpenter, one of two contiguous houses (459 Marlborough and 10 Charlesgate) built at about the same time for Thurlow Weed Barnes and his wife, Isabel Frances (Morris) Barnes. Isabel Barnes is shown as the owner on the original building permit application for 10 Charlesgate, dated July 29, 1889, and for 459 Marlborough, dated September 16, 1889. On June 2, 1890, the newly completed house at 459 Marlborough was purchased from Isabel Barnes by Mary Alice (Rawson) Turner, the wife of banker and broker Albion Bryant Turner. They previously had lived at 253 Commonwealth. They continued to live at 459 Marlborough during the 1890-1891 season, but moved thereafter to Newton. On December 22, 1892, 459 Marlborough was purchased from Mary Alice Turner by Elizabeth Bradlee (Abbot) Stimson, wife of Frederic Jesup Stimson. They also maintained a home in Dedham, which had been their primary residence for the past few years. During the 1888-1889 winter season, they had lived at 40 Commonwealth. During the 1895-1896 winter season, the Stimsons were traveling in Europe and 459 Marlborough was the home of Henrietta (Jones) May, the widow of George Perrin May, who had died in September of 1895. He was a retired shipping merchant and, for the last eighteen years of his life, had served as quartermaster of the Ancient and Honorable Artillery Company. Prior to his death they had lived at 16 Rutland, and she had resumed living there by 1897. Elizabeth Stimson died in Venice in June of 1896. 459 Marlborough was inherited by Frederick Stimson and their two daughters, Mildred and Margaret. Frederic Stimson continued to live at 459 Marlborough and married again in November of 1902 to Mabel Ashhurst. After their marriage they lived at 459 Marlborough and in Dedham until the 1903-1904 winter season, after which they made Dedham their sole residence. 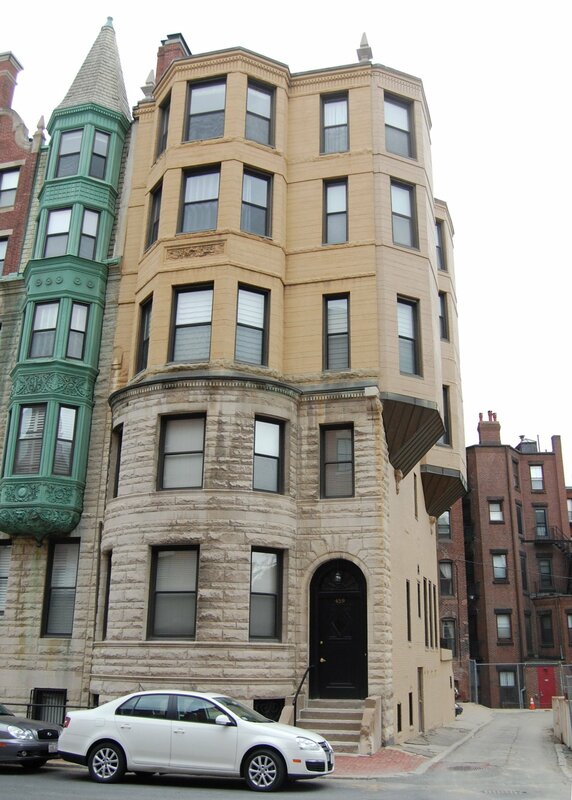 Frederick Stimson and his daughters continued to own 459 Marlborough and lease it to others. During the 1904-1905 winter season, 459 Marlborough was the home of Hugh Davids Scott and his wife, Helen Livingston (Sanders) Scott. He was New England representative for the Philadelphia Rubber Works and the Keystone Coal and Coke Company. They previously had lived in Pennsylvania. By 1906, they had moved to Wellesley. During the 1905-1906 winter season, 459 Marlborough was the home of Miss Mary (Polly) Gurley Porter. She and her brother, William Deering Porter, Jr., had lived at the Hotel Victoria at 273 Dartmouth during the previous season. By the 1909-1910 season, they were living at 101 Mt. Vernon. At about this time, she met her life partner, Mary (Molly) Williams Dewson, with whom she was active in a wide range of social welfare, feminist, and progressive causes (Mary Dewson later served as Eleanor Roosevelt’s successor as head of the Women’s Division of the Democratic National Campaign Committee and, in 1937, was appointed to the Social Security Board). During the 1906-1907 winter season, 459 Marlborough was the home of Mary Wallingford (Herrick) Dame, the widow of Frank O. Dame, who had recently returned from travelling abroad. Her daughter, Mrs. Gertrude Augusta (Dame) Collier, the former wife of Rev. H. Price Collier, lived with her. They also maintained a home in Brookline where they previously had lived and resumed living in 1907. On June 1, 1907, 459 Marlborough was purchased from Frederic Stimson and his daughters by Harriet (Putnam) Hayden, the widow of Horace John Hayden and the sister of J. Pickering Putnam, who had designed and built The Charlesgate. She also served as trustee of the Putnam family trust, which owned The Charlesgate. She converted 459 Marlborough into five apartments which were leased in conjunction with The Charlesgate. It remained her separate property, owned by her as an individual, whereas 4-10 Charlesgate East were owned by her as trustee of the Putnam family trust. From this point, however, it was operated as an integrated property with The Charlesgate and on July 30, 1923, she sold both 459 Marlborough and 4-10 Charlesgate East to Herbert G. Summers and Mary G. Potter.